Kyle Carpenter Studio Pottery: Come on out! My concern is "do you have enough pots?" The show looks good! 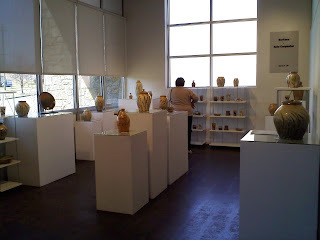 Good luckand say hi to E and L.
Thanks for spending time talking glazing, firing and brush strokes. I wish you had more pots. We arrived about 4:50 and so many of your pots were already sold. So as per our conversation I'll find out your next showing that's somewhat local and purchase then. I really enjoyed experiencing your work. It's nice to feel it. I enjoy your work. Take Care!